We sat in silence. It was my turn to talk. I’m pretty good in business situations. Not so much in social ones. At social events, mostly I hold up walls. Shake hands. Grunt a lot. Let others carry the conversational load. Lorraine set our meals in front of us. The full burger with everything for him. The grilled mountain trout and steamed vegetables for me. “You do a lot of fishing?” I managed after a long silence. He looked skeptical and almost self-conscious. “It can’t be so easy,” he said with a little laugh. “What about the different rods, lures, tackle, stuff?” He looked so serious, as if I were missing the point. As if I didn’t understand. He was right. I didn’t. I lifted my hands and looked down at the mess that were my paws. Calluses, nicks, cuts, punctures, blunt fingers, the bandage now off the one with the splinter. These were the hands of a man who’d framed houses as a tall, rangy preteen and had lived in construction ever since. Could I catch a fish with my bare hands? “Yeah. All it takes is absolute stillness and patience.” I sighed. “Not a whole lot of people have both together. Somebody once told me it’s all about Zen.” Somebody else said the only reason I could do it was because I was too stupid to know it was impossible. “Zen.” His tone said he was surprised I knew such a word. “You know, like the Eastern religion,” I answered. “Though why we still call it Eastern is beyond me. It’s really Far West, not Far East to us.” I was grumbling and rambling. Avoiding for some reason. He rattled me. Nobody ever rattled me. 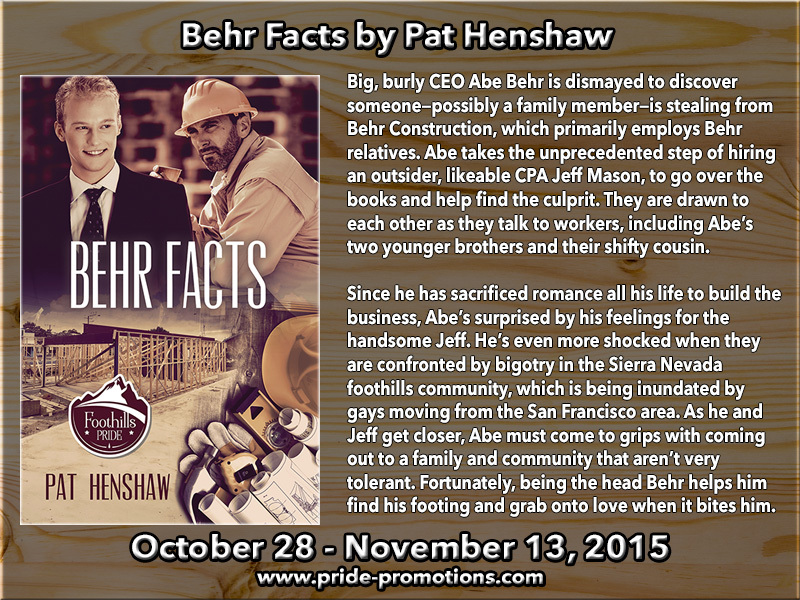 I’m Abe Behr, the big Behr. He was studying me as intently as I was him. He appeared too beautiful, too perfect, too unscarred. I just hoped his accountant skills were as perfect as he looked. “What kind of fish you want to catch?” I asked. Staring at him wasted our time. He looked like he’d never eaten any in his life. He’d finished his burger but didn’t make a move on my fish. His expression was split between wanting to dig in and reluctance to do so. His eyes snapped up to meet mine. His puzzled stare asked if the stupid bear had deliberately made a joke or not. Then he gave a happy, hearty laugh, and his fork raided my fish. “So? What do you think?” I asked after he swallowed. 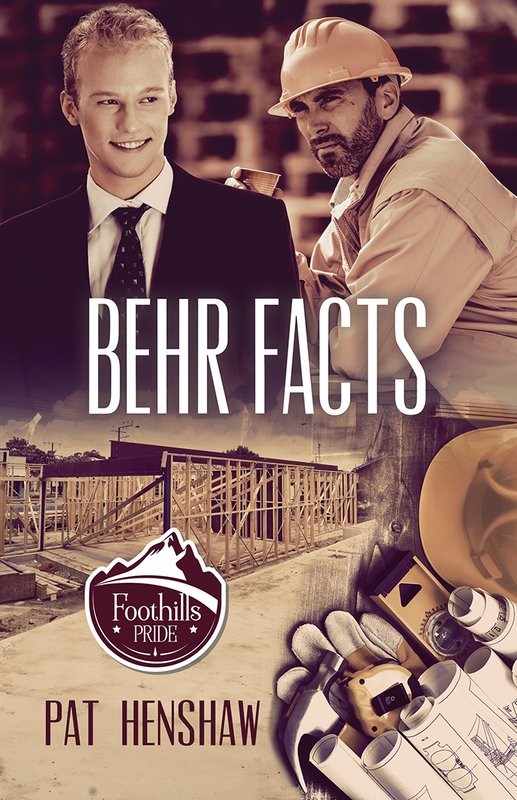 Pat Henshaw, author of the Foothills Pride Stories, was born and raised in Nebraska and promptly left the cold and snow after college, living at various times in Texas, Colorado, Northern Virginia, and Northern California. Pat enjoys travel, having visited Mexico, Canada, Europe, Nicaragua, Thailand, and Egypt, and Europe, including a cruise down the Danube. Now retired, Pat has spent her life surrounded by words: Teaching English composition at the junior college level; writing book reviews for newspapers, magazines, and websites; helping students find information as a librarian; and promoting PBS television programs. Her triumphs are raising two incredible daughters who daily amaze her with their power and compassion. Fortunately, her supportive husband keeps her grounded in reality when she threatens to drift away while writing fiction.